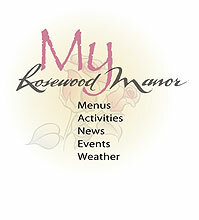 All rooms at Rosewood Manor are private and include a nurse call system, and hook-up for phone and cable television. Residents can choose from furnished private, semi-private, deluxe semi-private and handicap suites, and are free to decorate their rooms with articles from home. Special accommodations can be arranged for couples. Convalescent, respite and vacation stays are also available.